December 2018: Support for UNHCR & ACAPS, 12 deployments, IM needs assessment in consortiums & Happy New Year 2019! This was a busy end of year for CartONG, with the 2018 GeOnG Forum and no less than 12 deployments in 3 months. CartONG also took part in several gatherings and conferences in particular, the Salon des métiers de l’humanitaire du Grand Genève organized by Cité de la Solidarité Internationale, and the Universités d’Automne de l’Humanitaire (UAH) organized by Groupe URD. In addition, CartONG was invited to join the International Workshop on Building Humanitarian Decision-Making Tools by York University in Toronto in November 2018. Locally, CartONG was also present at the Festival des Solidarités in Lyon, the Migrant’Scène Festival in Chambéry - with an exhibition of sensitive maps - and took part in awareness raising activities on International Children’s Day. 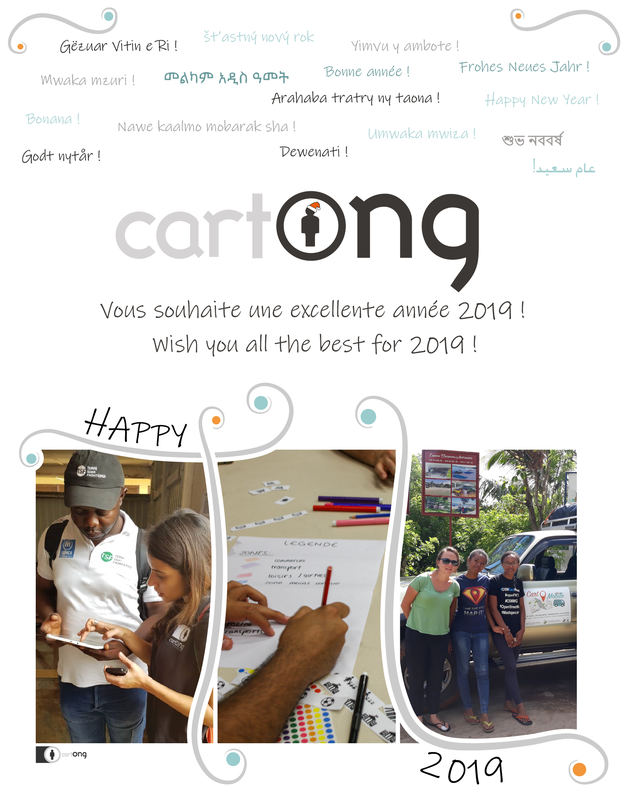 CartONG’s team wishes a great end of year and a very Happy New Year 2019 to all its partners, members and volunteers! 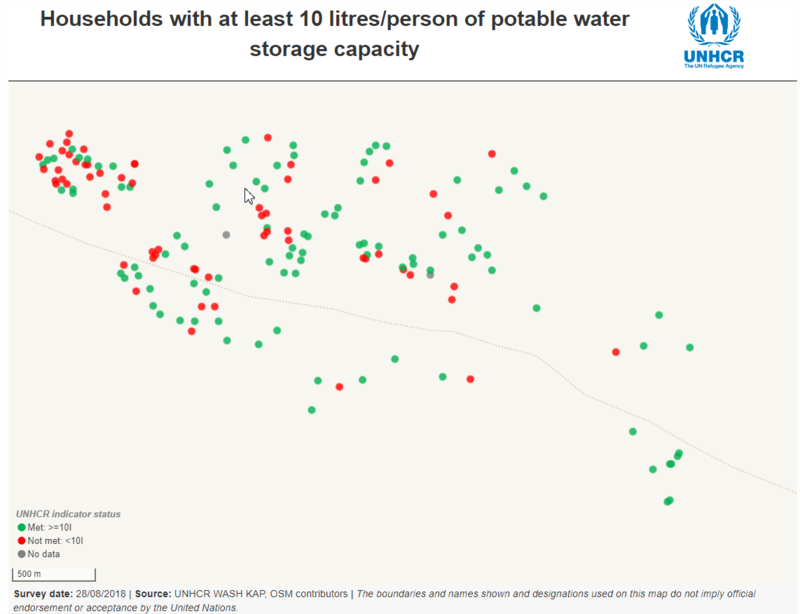 CartONG has been supporting the UNHCR Water, Sanitation and Hygiene (WASH) team for 3 years on the deployment of WASH Knowledge, Attitudes and Practices mobile surveys in many countries. Over the last year, every time we trained UNHCR and implementing partners on how to best deploy WASH KAP surveys in the field, we have been promoting the mapping of the refugee camps mainly for two reasons: 1. It helps to plan out the survey logistics and the sampling, and 2. It allows to analyze survey results by taking into account the spatial context and the actual location of the WASH infrastructure. We believe that doing so helps improve the overall access to WASH services for refugees in the long run. To learn how, check out our news. In recent years, CartONG's information management (IM) team has continually grown and progressively expanded its fields of activity, in particular by accompanying more and more frequently consortia in their IM. Often called to the rescue, several months after the launch of consortia to facilitate IM within them, CartONG had the opportunity this autumn – a quite exceptional situation – to intervene before the launch of a consortium at the request of its partner, the operational NGO Solidarités International. Indeed, CartONG was deployed in October 2018 to carry out a preparatory assessment of information management needs within a newly created consortium, of which Solidarités International was to be the lead. To learn more about why it is so important to encourage upstream information management needs assessment within consortia, read our article here. Since May 2017, CartONG has been supporting the information mission of ACAPS (the Assessment Capacities Project). ACAPS is an independent H2H information provider which supports the humanitarian community by providing up-to-date data on more than 40 key crises around the world. In the event of a crisis, the analysis and information work carried out by ACAPS allows humanitarian, and also national actors, to better understand and consequently better respond to the needs of the affected population. As part of this mission, ACAPS regularly issues bulletins called "Briefing Notes" containing situation maps. 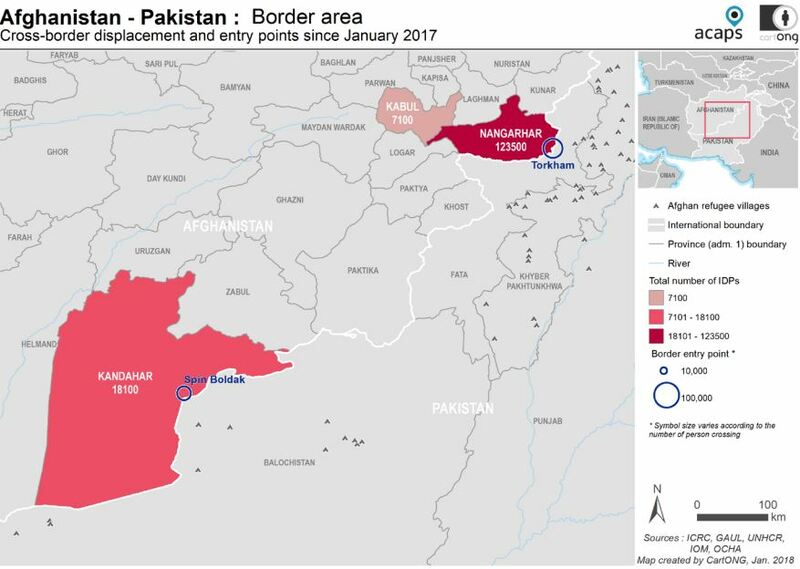 CartONG provides support to ACAPS by producing a significant number of these maps that complement and illustrate the bulletins by highlighting affected areas, hot spots or key figures of a crisis. In 18 months of collaboration, CartONG has responded to 20 map requests. Here is a look back at the collaboration between ACAPS and CartONG. Discover the after-movie of the 2018 GeOnG Forum! Organized by CartONG every two years since 2008, the GeOnG forum gathers humanitarian and development actors and professionals specialized in information management. 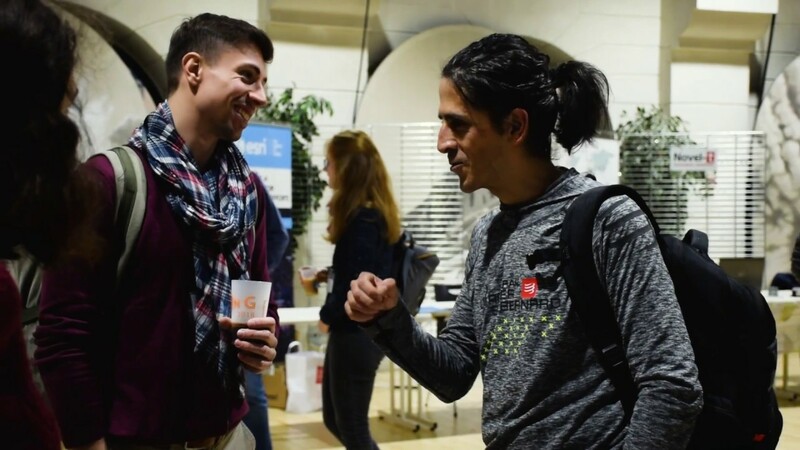 The 6th edition of the forum took place from October 29th to October 31th 2018 in Chambéry (France) and gathered more 190 participants from more than 90 organizations. Watch the after-movie to get a feel of this year’s edition. You can also check out these 3 interviews from RCF Savoie, Savoie News and RCF to learn more about the 2018 edition (resources only available in French). We have also published all the videos & presentations from the GeOnG roundtables, plenary sessions and lightning talks on our website. 1 Map Centre launch after 2 years of hard work on an ambitious project! CartONG facilitated with the Information Management (IM) advisor of HQ an IM workshop for M&E and IM staff in November in Amman, Jordan. The workshop aimed to improve the information management skills of Tdh for the MENA region. The idea of this being a workshop (rather than a training, as we usually do) was for the participants to leave the workshop with as much actionable procedures and knowledge as possible. 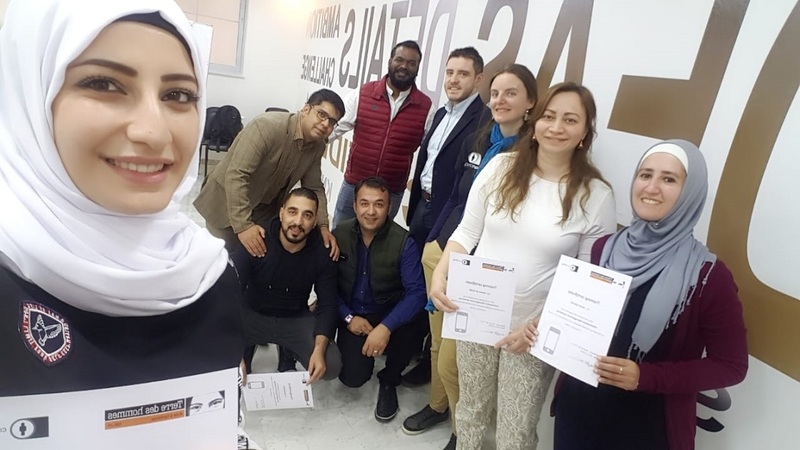 7 staff from Jordan, Lebanon and Afghanistan were trained, with a specific focus on improving their data analysis skills and the implementation of data protection in their day-to-day projects. They also wrote their own short-term and long-term action plan postcards that since were sent to them to remind them of their to-do list. A staff of CartONG was deployed for 3 weeks in October in support of the Afghanistan mission of ACF France. The mission aimed at providing Information Management support to the team based in Kabul regarding digitization of some nutrition processes, data visualization with Business Intelligence tools, training sessions on various tools (Excel, Kobo, Sphinx and Power BI) and support on their data protection practices. As one ACF AF staff testified: "CartONG played a big role [by transferring] its professional expertise and technical skills, and [by supporting] capacity building within the mission." 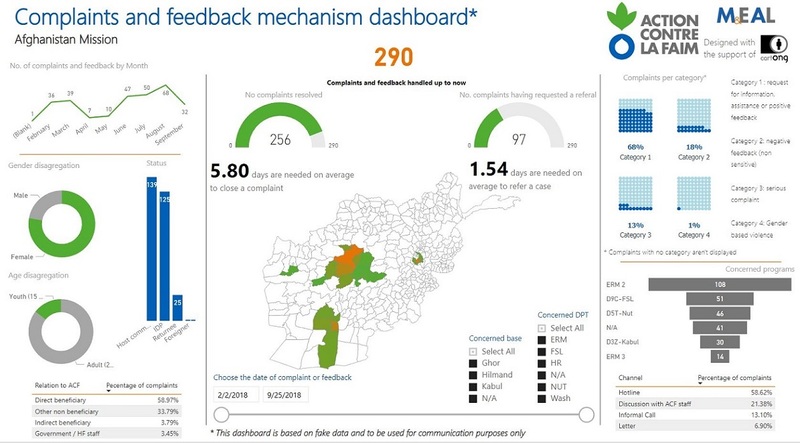 Check out an example of the tools developed during the mission: a complaints and feedback mechanism dashboard built on Power BI. Blog post: Mobile data collection: more quality, less cleaning! Discover other resources on our CartoBlog! CartONG is reviving its monthly mapathons in Paris and Lyon, and launching new bi-monthly mapathons in the cities of Grenoble and Chambéry. Follow us on Facebook to stay tuned! CartONG will take part in the H2H session at HNPW: learn more about it on the event website. You’re interested in CartONG's activities? You have a few hours to spare this Christmas? 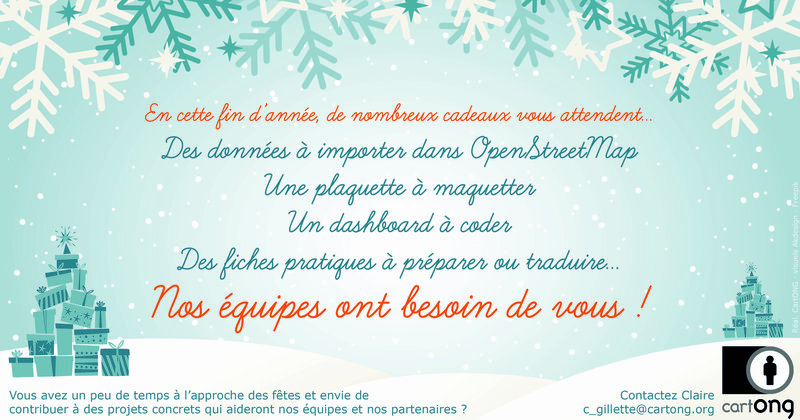 You have skills in design, mapping, communication, OSM, coding or other that you think might be relevant to us? Do not hesitate to contact Claire to check the volunteering missions currently available. Your help is much appreciated!